It's all about spreading kindness! Among other stuff, they'll be creating a kindness quilt!! -Hillcrest's first Coffee House of the year is on Thursday (20 November ). Live music and in support of charity. $3 admission. -Hillcrest's Handmade Holiday Bazarre is on Saturday 29 November from 9a to 2p. Admission is a donation of one non-perishable food item for Fill the Bus. U can book a table by calling the office at 856-3419. -Evergreen School is having Hat Day on Thursday (20 November). Pay $1 & wear a hat. Money goes to the Good Will Fund to buy Christmas gifts for less fortunate families in the community. 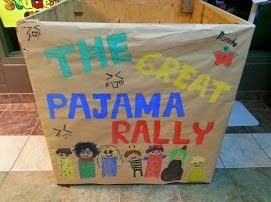 -Evergreen's Great Pajama Rally continues. Students are working at getting as many new PJs donated as possible in November. PJs go to kids at Moncton Headstart and Crossroads for Women, and some will go back to kids at the school who need 'em. You can drop off a new pair of pajamas (any size) to the Evergreen School lobby from 8a-4p. -HTHS' production of Legally Blonde – the Musical is coming up. Tuesday 18 November there's a special matinee performance for students from Birchmount and Queen Elizabeth schools. Performance dates for Legally Blonde – the Musical are Thursday 20 November and Friday 21 November at 7p then Sunday 23 November at 2p. Tickets are $10 for adults and $8 for seniors and students, available at the school’s main office, Steeves’ Jean Coutu on Mountain Road, Ford’s Jean Coutu in Riverview, the three Reads locations: Mountain Road, Main Street and Coverdale Road. Tickets are also available online at https://District2.SchoolCashOnline.com. -Some of Queen E School's grades 5-7 classes will be walking to HTHS to attend the Legally Blonde play on Tuesday 18 November. The cost is $2 per student. -Queen E's Grade 4s will get a visit from Geologist, Gary Plewes, on Wednesday 19 November. Sample rocks and minerals will cost between $1 and $3 if students want to purchase one. -Petitcodiac Regional High School students will receive CPR training from the Heart and Stroke Foundation on Wednesday 19 November. -JMA Armstrong High's Food Drive is underway for students and staff to collect non- perishable food items and toys for Helping Hands food bank. -Forest Glen’s students get to check out a planetarium on Friday 21 November! -Forest Glen’s annual Christmas Bazaar will take place on Saturday, 6 December from 9a-3p. -​The MHS nutrition committee is selling a memorabilia cookbook that can be purchased through School Cash Online, at the Office of the Superintendent or at Moncton High School (see Ms. Whalen). Cookbooks are $10 and would make a great stocking stuffer. All profits will go to the Knight’s Kitchen that provides healthy snacks and home cooked meals daily for any student who is in need.